Thank you for stopping by our blog. Here you can see what the Lord is doing on our campus for His glory! If you would like to know more about fellowship and outreach times, check out our info on the right of the blog. We pray that we will enjoy fellowship with you soon! Saturday: Click here to see dates/locations. Join our email list for dates and times! Special Events: Click here for list. Tuesday's outreach this week at Pitt included several good conversations. Austin, a student at Pitt, was very receptive as Gene took him through the Law and the Gospel. His friend Gary, possibly a Christian, showed up a few minutes into the conversation but seemed to agree with all he had heard Gene was saying. Later, Gene had another conversation with a student named Rina with whom he was able to not only go through the Law and the Gospel but explained also why he was there. It was simply because Gene cared about where she will spend eternity, preferably in heaven and not in hell, that he lovingly communicated to her. Jenifer and I had a fascinating conversation with a young man named Reed who is studying Biomedical Science and Religion. Reed is a Calvinist who believes that an evolutionary process took place prior to Adam and Eve's arrival on earth. During our conversation Jen was able to communicate the reason for Biblical creation while gently refuting the evolutionary worldview of creation that some Christians hold fast to. Everyone we spoke to Tuesday evening who accepted our invitation showed genuine interest in coming to the Bible Study. Please pray that they will join us, and should we see them again, to go further in calling them to repent and trust Christ. Finally, please pray for a man whom I met with for a brief moment. Though our conversation lasted all of about 3 seconds, it was to me, however, one of the most memorable of the evening. There wan't enough dialogue exchange for me to obtain a name but the gentlemen was African American and sported a "Star of David" pendant on his necklace. When I inquired of it he became visibly upset and quickly hurried away. It wasn't until we sat down for Bible study that Jen explained to me that the gentleman I had met earlier might have been part of a group known as the Black Hebrew Israelites. Looking back I am grateful our encounter was so short because after doing some research the next day I realized I knew absolutely nothing about this group nor how to appropriately engage. It probably goes without saying, but if I have learned anything by being in this ministry it is to take all of the unanswered questions that may arise during a witnessing conversation (however brief) and research, research, research! You never know if you'll run into that same person again the following week or someone totally different who may pose the same objections. The key is to be ready always to give an answer to every man that asks you a reason of the hope that is in you (with meekness and fear of course) - 1 Peter 3:15. Please keep Gene and I in your prayers as we go out each week on campus to witness and be sure to check back shortly for a follow up to this post on what I discovered during my research about the Black Hebrew Israelites. It was my first time back since we took off for summer break and I was so looking forward to being here at Pitt! Though I was feeling a bit nervous (typical pre-witnessing jitters) the desire to share the gospel quickly overrode any feelings of doubt and fear prior to me hitting the street for our weekly outreach (an encouraging text from my mom helped too!). 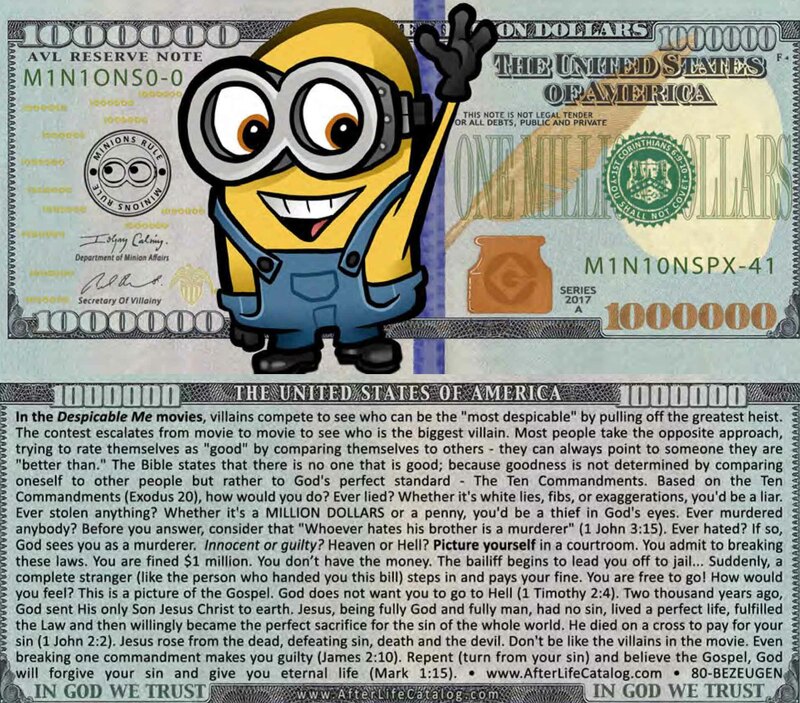 The gospel tracts I used tonight were Eight Lies You Hear on Campus and In the World from First Love Publications and Minion Million Dollar Bills from Bezeugen Ministries. Campus Leader Gene gave me a stack of Bible Study invites along with the command to hand them out. And so I did. By the end of our outreach we were both pleased to discover that we had given out all of our invites! Its always a good feeling for me to walk away empty handed after a night of witnessing. One of the lessons I (re)learned tonight was to never judge a book by its cover. An elderly lady was walking in my direction when the thought came to my mind that I shouldn't hand her a Bible study invite simply because she did not resemble a student. Brushing that notion aside I handed her one anyway and to my surprise she not only took one but asked for directions to the location and times! If she doesn't attended personally my hope is that she will know someone who can. All in all it was a good first night for outreach. Hoping next week as students begin adjusting to their new schedules they can make the Evangelism Training/Bible Study. Please pray for those who received tracts tonight that God would use them to stir their hearts for the gospel and for those who received Bible study invites that the Lord would fill these seats at Posvar Hall with those who are hungering and thirsting for righteousness. Our first week on campus we posted flyers on the campus bulletin boards, handed out several hundred invitations to our Tuesday night Evangelism Training/Bible Study and we also handed out several hundred Gospel tracts! Several students asked for directions to Wesley W. Posvar Hall and showed interest in coming to the Training/Bible Study. Gene met a student from his church who is a sophomore and said he would come Tuesday Night. His name is David. Pray that he does end up coming and gets on fire for reaching the lost. What makes CCN different from other ministries? At CCN, we pray, worship, and fellowship together. CCN also focuses heavily on rooting and grounding Christians in their faith, strengthening their foundational theology (study of God), and preparing them to "be ready always to give an answer to every man that asketh you a reason of the hope that is in you with meekness and fear" (1 Peter 3:15) through the use of apologetics. Oftentimes, we will study another faith and learn how we can share Christ with the followers. We also go out together on campus for evangelistic outreaches each week, along with open-air preaching on and off campus. We desire to make Jesus FAMOUS on and off-campus!